the designs of many designer pairs as well, so love it when I can find a dupe. I have been lusting over the Quay My Girl glasses recently but wasn't sure if the style was for me and didn't want to risk it with the £30-£40 price tag. I randomly found THESE sunnies for £12!!! on Asos. I tried the Quay sunglasses I did want in a Topshop store, and let me tell you these are almost exactly like them (material, weight, feel etc.). And of course they have complete UV protection. I had also been randomly wanting the round style Ray Ban sunglasses (Model code: RB3447) but as usual with the £125 price tag and not sure if they even suited me, I wanted to find a cheaper alternative. I found the dupe in Primark and they literally cost around £5! They do have a pink lens, but I kinda like that - they look a bit qwerky! 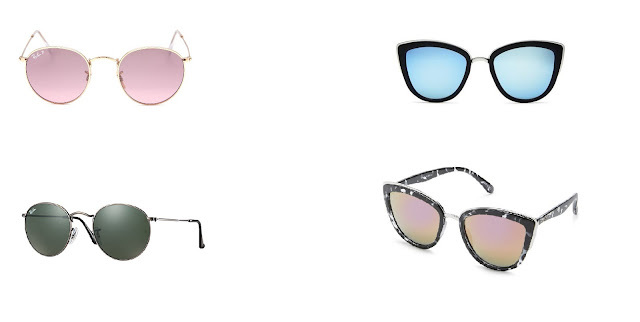 Have you found any good sunglasses dupes? When you see people with drawers full if designee glasses I'm just amazing and how they can afford it! Accessorize has some good sunglasses in at the moment too! I love these dupes! The pink lenses one especially are so gorgeous and unique! These look like great dupes! I always pick up sunglasses from River Island or Miss Selfridge, they do good dupes of RayBan too! These are such awesome dupes! I love Quay sunglasses, have a pair and been thinking about buying more! These pairs are fab! The dupes you found are just as beautiful! Like you I wouldn't spend too much money on sunglasses because I break them all the time anyway. I just buy mine at Forever 21 because they are so cheap (though they don't have UV protection). I love those round pink and gold glasses so much! I LOVE Quay sunglasses but I feel the same way! Plus, since I don't wear sunglasses too often, I hate spending so much money on ONE pair. That's awesome you found good dupes though! Awesome dupes, love the styles! My fav is black ones! Have a good day dear! Ooh both of shades are gorgeous - serious summer vibes, especially with the gorgeous pink-tinted lenses on the gold frames!! I dont spend much money on expensive sun glasses either. I look for one with good UV protection and the chose a shape that suits me. These dupes are amazing! I'm going to have to have a spend now and I wont feel guilty ehe!! !